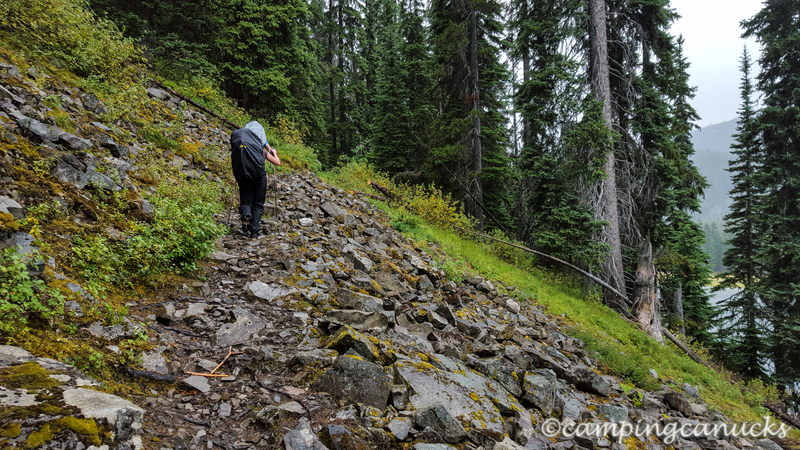 Over the years, we have done a couple of the different backpack trips available in EC Manning Provincial Park, including Poland Lake and the Lightning Lakes Chain Trail but the Frosty Mountain Loop Trail was our first trip that really took us into the alpine of the park. We had considered this trail as well as the Skyline II, but the Frosty Loop had the advantage being that we could park in one spot and complete a loop. We spent the night prior at the Coldspring campground, which was quite busy and very noisy due to the nearby highway where we awoke to a good, steady rain to help us along our way. 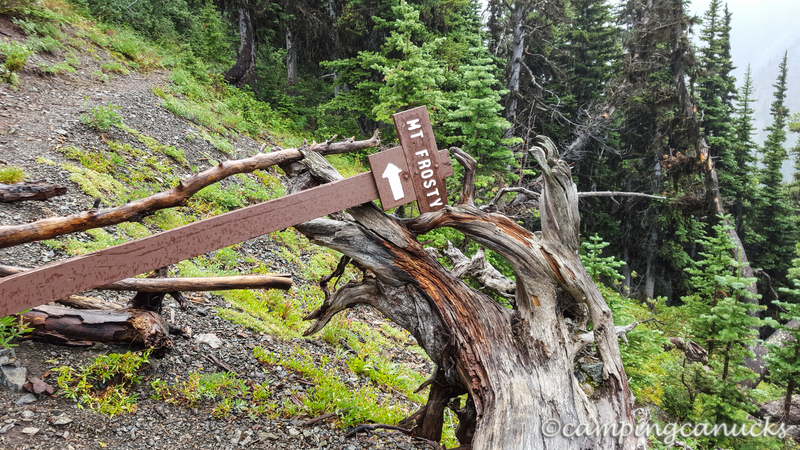 While considering the route with our friend Anthony, we had decided to start from the Lightning Lake trail head and exit from the Windy Joe trail head. 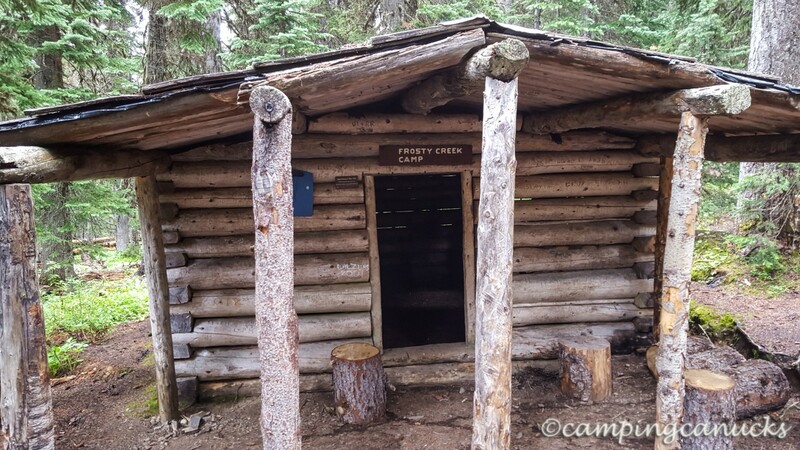 As to where we would camp, we figured that we would either stay at the PCT Camp or if we were feeling up to it, head up to the Windy Joe Watchtower and stay there for the evening as this was to be an overnight trip. 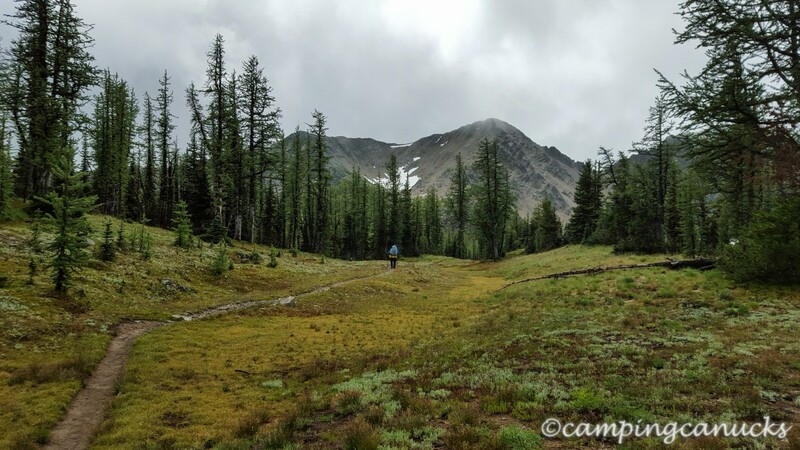 Due to some confusion with the instructions and because of an incorrect map, we ended up walking around Lightning Lake before circling back to the start of the trail which was only a couple of hundred meters from where we parked. Not a big deal but it was an hour and four kilometers of backpacking that we could have done without. Once we got to the correct trail, we immediately began to climb and that was pretty well the whole story all the way to the mountain. It’s a climb almost all the way. At first the rain was relatively light but eventually it turned into a pretty steady downpour, so we broke out the rain gear and continued on our way. Fortunately, it was fairly cool so we didn’t get too warm in the rain gear. Needless to say, there was very little to see for the first while due to the rain and clouds and being in the trees for the most part. It was fairly unremarkable for the first couple of hours as we worked our way up to the Frosty Creek Camp. Seeing that there was a shelter there, we stopped for a bit to have something to eat before we continued on our way. At this point, we were only about four kilometers from the peak, but it started to get a bit steeper from this point onwards. We were now beginning to get above the treeline and crossing some of the first sub-alpine meadows. We could now see Frosty Mountain in the distance through the clouds, although at times it was quite obscured as the clouds moved in and around the peak. This area is also known for very old larch trees, some of which are over 1000 years old. This puts them as some of the oldest trees in Canada. Their relatively small size due to slow growth in the cold climate at this elevation belies these ancient dwarfs. The trail got substantially steeper as we got closer to the peak. We came upon a rough camp site which we think would make for a nice alpine camp on another trip. There was room for about two tents and a nearby stream for water. It was obvious others have used it as there was a good place to sit and have a cooking area near the stream. 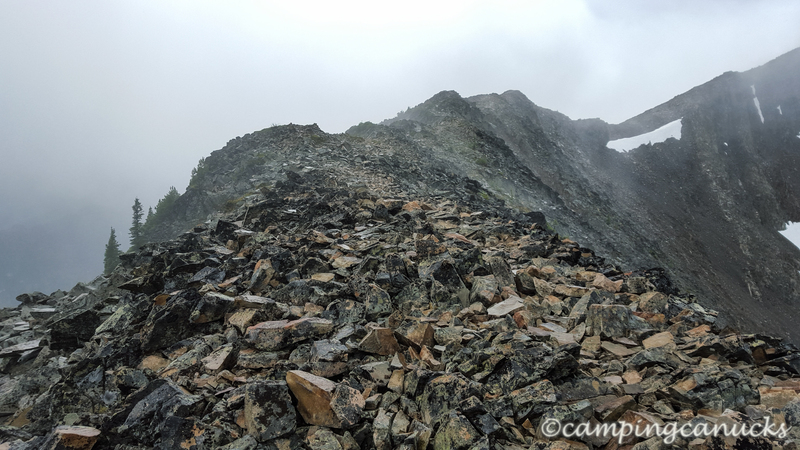 Once past this point, we hit the first of the toughest part of the trail where the talus slope began. While it wasn’t really difficult (although the trail became obscure from time to time), we did have to watch our footing carefully on the slippery, wet rocks. Having full backpacks on slowed us a bit but it wasn’t long before we came to the top of the ridge where the junction to Windy Joe was. 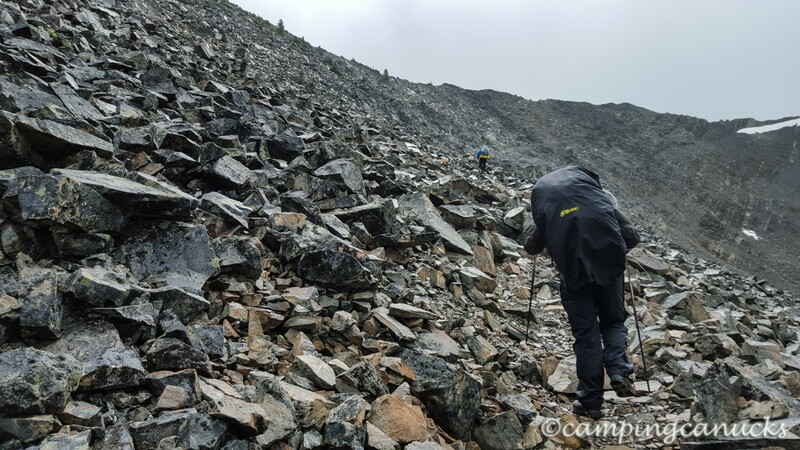 The rain was beginning to let up a bit at this point so we dropped our packs and made our way up to Frosty’s peak. 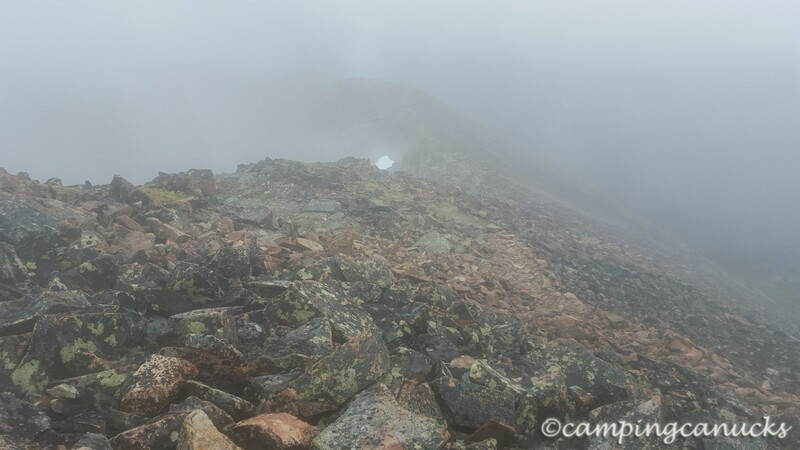 There are two high points but we were not sure if we would get to the highest peak or not due to the clouds. 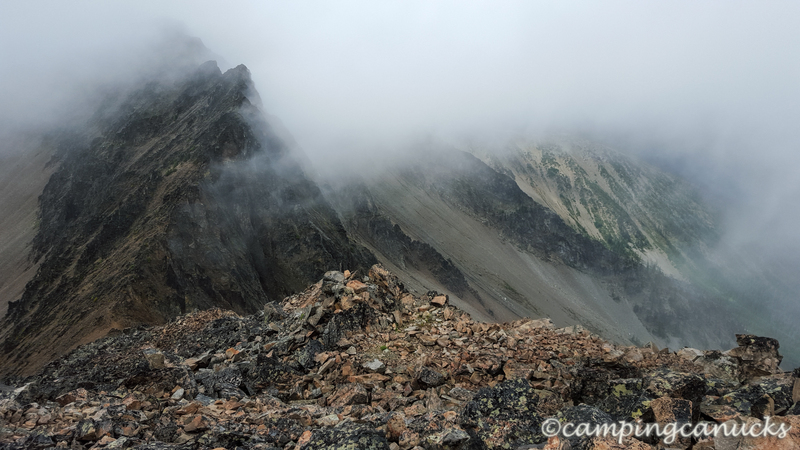 The trail was steep and slick in spots as we made our way through the clouds that continued to coming rolling in. We had absolutely no view to the south but could see quite in ways in most other directions. Unfortunately we could not see Castle Peak on this day, which is supposed to be quite a remarkable peak. It was only 600 meters or so from the junction to the top of Frosty E1, which was as far as we made it on this day. Due to the cloud and rain, we decided it wasn’t worth the risk to continue on towards Frosty’s highest point. We had to settle for cloud obscured views of the other peak. We wandered around the top for a few minutes, grabbed a geocache that was up there, and made our way back down to our packs. While the rain had finally given us a break, it was still quite windy and cold at the top. 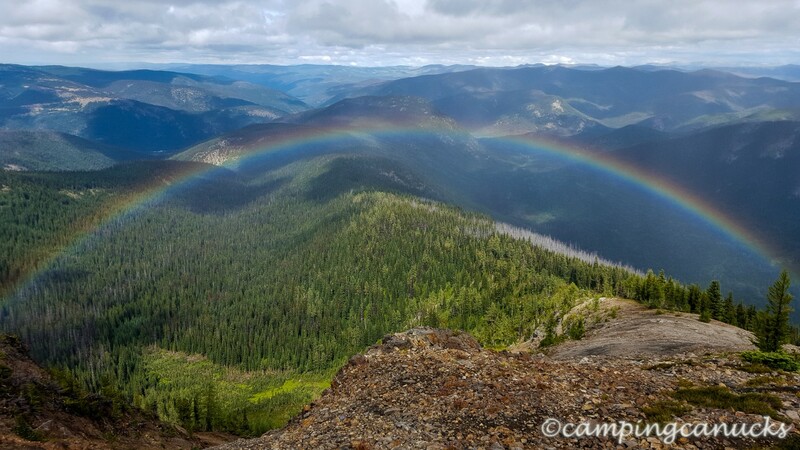 We were lucky enough to be granted a great view to the north with a rainbow lingering over the ridge. We reached the junction, grabbed our packs, and made our way down the Windy Joe side of the trail. While not terribly steep, it was still a bit of a tricky descent down the ridge. And the rainbow continued to linger to the south of us. 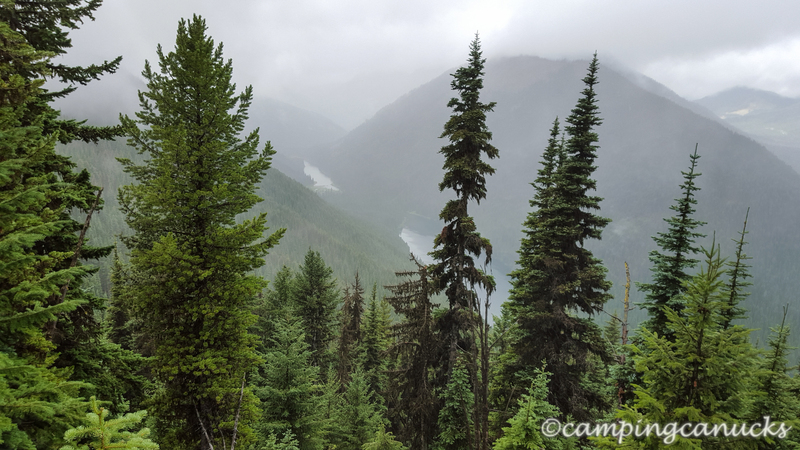 Moving back to down to the treeline, the clouds began to lift more and we could see more of Washington State’s Cascade Range and peaks that surround the northern trailhead of the Pacific Crest Trail. An ambitious hike for those who have the time and the desire to make the trip all the way to Mexico. Much of the next couple of hours were downhill as we made our way to camp for the night. 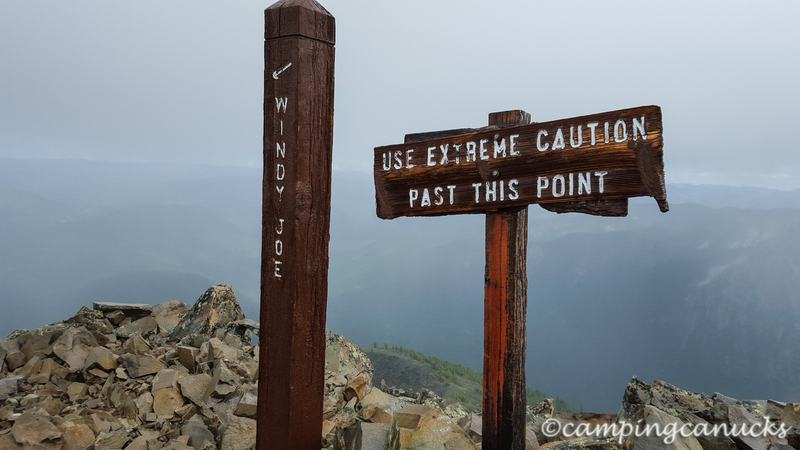 We had decided by this point that we would be stopping at the PCT camp for the night and tackling Windy Joe the next day. Back in the trees, we made good time as the trail was in great condition until eventually, foot sore and tired, we rolled into the PCT camp. There was no one there and we were to have the camp to ourselves for the night. It’s too bad there was a fire ban because there was a fire ring and plenty of wood to be found. It would have been nice to have a camp fire to relax beside for the evening. As we were so tired, we more or less set up our tents, had ourselves some dinner and rolled into bed for the night. It sprinkled lightly overnight but we were greeted with a nice clear sky the next day. We had a shorter day for Day Two, so we quickly packed up and headed on our way down to the PCT trail back to the valley below. 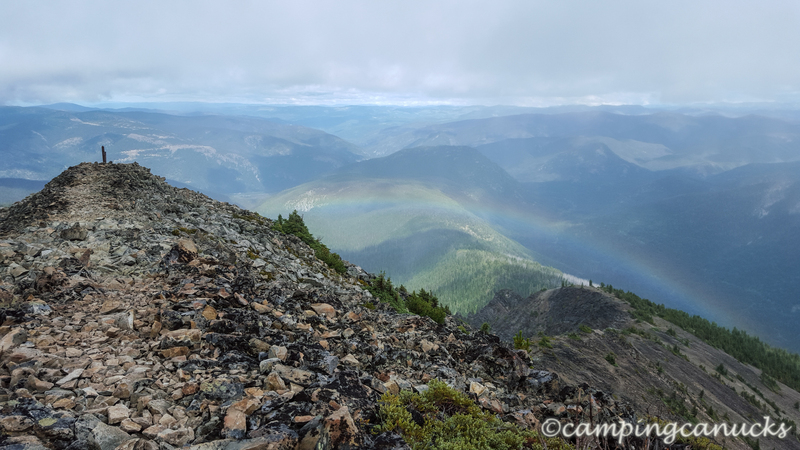 When we reached the Windy Joe junction up to the tower, we dropped our packs and made our way up to take a look. It was a few kilometers up so we were glad that we had not decided to make for the tower the night before. 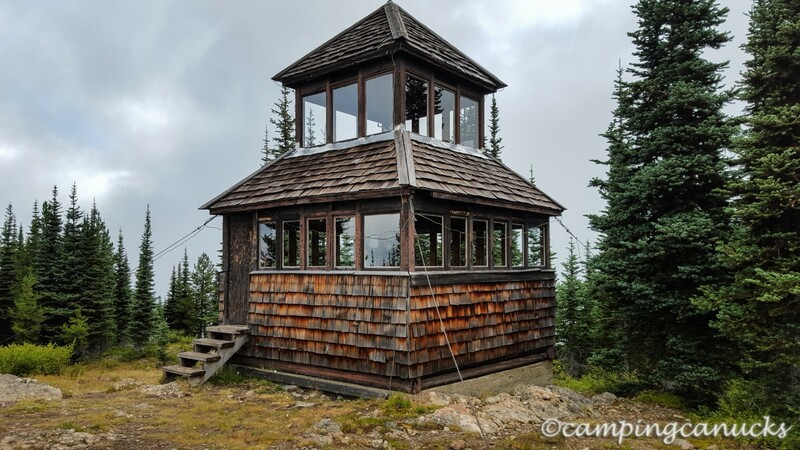 The tower is in good condition and looked like it would be a good place to spend a night. Water would be a problem, though, as there is none nearby so one would have to carry water up. We will consider coming back here in the winter someday and in that case, snow could be used for water. After leaving the tower, we picked our packs back up, and continued on our way. We began to encounter day hikers and trail runners but for the most part, it was still quiet on this part of the trail. It did seem like it took us a long time to get back down to trail head, where we determined we still had to walk a couple of kilometers to the car. Luckily, it was relatively flat for the most part. Frosty Mountain Loop did make for a fairly strenuous trip, which according to our GPS track, worked out to be 24 km on the first day, plus another 14 km from the camp back to the car, including our side trip up Windy Joe. While the weather didn’t work completely in our favour, it as actually nice that it was not really hot. This trip would have been a grind hiking up the mountain in +30 degree temperatures. It would have been good to enjoy more views while up on the peak but hiking in the mountains sometimes works out that way. 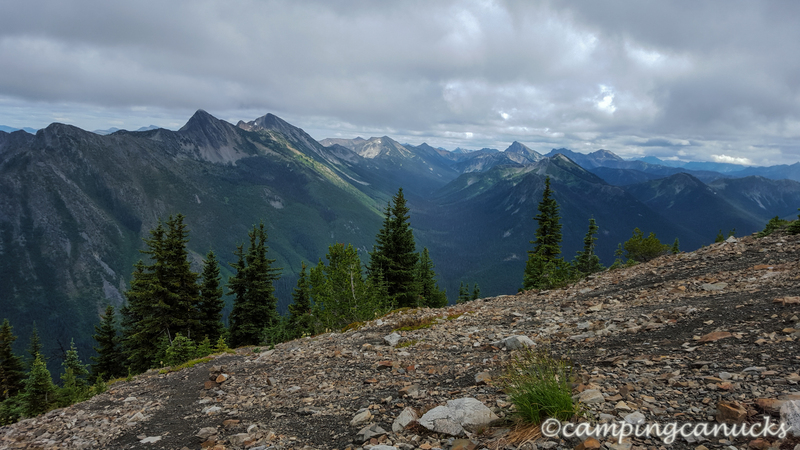 We would recommend the Frosty Mountain Loop for anyone looking for a good long overnight trip. Of course, many people make it a day trip from one of the trail heads but we did enjoy taking the time to spend the night out on the trail.